Steps to the ocean a dream lifestyle like no other. If you are a golfer,ocean lover or nature lover, enjoy entertainment and the nightlife, you'll feel like you are in Paradise! We invite you to step inside this exquisite Mediterranean luxury style condo where you will see soaring ceilings as well as calming cool coastal colors. These 26 condos are tucked away on a very private cul-de-sac. Families are surrounded by native oak trees draped in Spanish Moss. Grab a cup of coffee and enjoy looking at the pond from your private terrace and enjoy the nature around you.Have your binoculars handy!This first floor villa has so many upgrades. You will love the gleaming hardwood floors, Sub Zero refrigerator and Wolf Appliances. 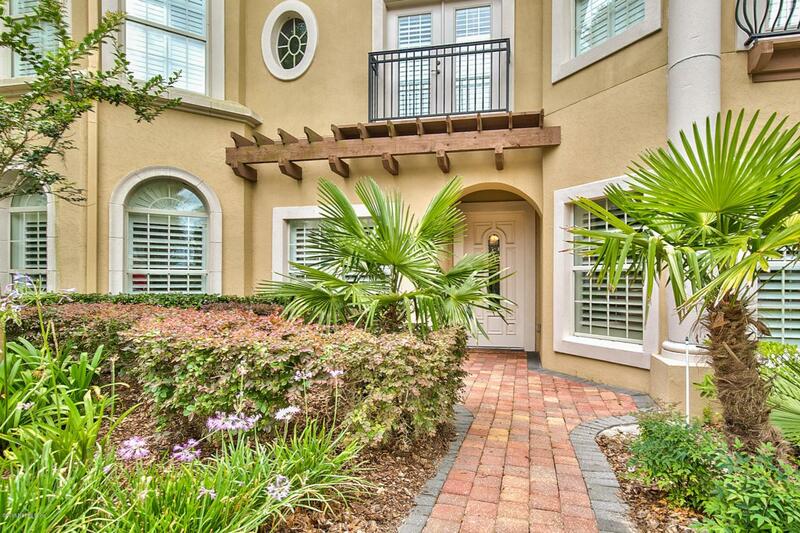 SELLER WILL PAY 6 MONTHS OF HOA FEE. ($3900 incentive)A show stopper kitchen you won't want to miss. You will feel proud to entertain your guests in your dream kitchen. The family room has a beautiful stone gas fireplace. Sliding glass doors lead you out to the screened-in lanai. The large retractable screened patio will make your family room expand to the outdoors and pond. For a more formal eating area you will see a formal dining room. The master bedroom offers a nice sitting area to sit and relax. It also includes plantation shutters, 2 walk -in closets, double vanity, and garden tub, and stand alone shower.The 2nd and 3rd bedroom have plantation shutters also. A Rinnai tankless water heater provides you with unlimited hot water. .A sub-basement,designed as a wine cellar has many other possibilities as well. This condo also has a 2 car attached garage and plenty of other space for your guests to park. This incredible condo is immediately available to be your home.